Is there such a city anywhere? I doubt it. 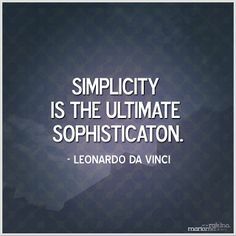 But we can make ourselves live in simplicity which as Da Vinci points out is the ultimate sophistication. Let me share with you my idea of the ultimate simple man. He is Jack Reacher. He does not have a home and lives in the clothes that he wears changing them every few days in a supermarket. He sleeps in motels and in whatever mode of conveyance that he uses to drift. He just carries a toothbrush in his pocket. I have written about him earlier and in that post had also introduced a great simplicist blogger Tammy. I had also mentioned my own regrets in the following words. This topic was suggested by Padmum for the weekly Friday Loose Bloggers Consortium where currently nine of us write on the same topic every Friday. I hope that you enjoyed my contribution to that effort. The seven other bloggers who write regularly are, in alphabetical order, Ashok, gaelikaa, Lin, Maxi, Padmum, Pravin, Shackman and The Old Fossil. Do drop in on their blogs and see what their take is on this week’s topic. Since some of them may post late, or not at all this week, do give some allowance for that too! This entry was posted in Blogging, People, Philosophy, Spiritualism, Values and tagged Dada Vaswani, Jack Reacher, Lee Child, Sindhis, Thornton Wilder. Bookmark the permalink. what a lovely thought. if there were such a city i would try to live there! i have always found a great deal of calm elegance in simplicity. it can make poverty elegant. it can lift up our soul and fill our eyes with beauty of another kind of something other than clutter and chaos. just a simple peace. a small space. and light and air. i never tire of it. that’s probably what i love the most about it. its innate elegance. thank you for the shout out and link to the humble and simple peanut rummy! you might know i would love this post. but then i always enjoy your contribution to the friday consortium! Yes, if a City could be built with strict rules on how much each citizen can have and use, it would be paradise on earth. i also read your other post linked here where you talked about him. now i remember where i’ve heard his name too! the marine reads jack reacher books. i knew it was familiar… just couldn’t place him. like you said also… i think my temperament would be more toward a sadhu then fighting bad guys and such. but either way… i’m probably not adventurous enough for either. i like a certain stability and routine to my life. not to say i couldn’t simplify it now even more. and may do so soon. i’m working more right now on internal simplicity. that is one i constantly struggle with! shorter posts. shorter comments. shorter replies. another character who was recommended to me by Shackman Travis McGee who lives on a barge. I love simplicity, too, but I doubt anyone would call my version of it elegant. 🙂 And I love my little apartment and wouldn’t like to be homeless. Cheerful Monk recently posted..Don’t Read Books! And that is the rub. Our attachments to our comfort zones which prevents me too from becoming a sadhu! I suspect if you keep it simple yourself any city has the potential to be Simplicity. Jack Reacher? I’d go with Travis McGee – he simplified his life and lived on a houseboat. Travis McGee is more of a buccaneer. Adventure comes looking for him for different reasons than the kind of accidents that lead to adventures for Jack Reacher. I read something recently, a guy in UK – first thought to put everything into storage – then decided to either sell or give away his possessions…travelled all over the world with more or less no money – as a bit of research/maybe a year. Found it so easy just carried on doing it…. A fellow I worked with did that, stored his possessions and went off adventuring. We lost contact, of course, so I don’t know how it turned out. If he’s still alive he would be in his mid-80’s at least. From what I have been able to gather from your posts, you are indeed a minimalist. I don’t think Jack Reacher’s lifestyle would be practical for most people. A few clothes and a toothbrush? What happens when he needs dental or medical treatment. Does he have any ID? And where does he get his food? Not so much simplicity as spartanism. I try to have a simple as possible lifestyle, but I couldn’t do without a centrally heated house and a car and my favourite books, music, films etc, all of which depend on very un-simple things like making money, doing repairs and tramping round bookshops. But not having children has greatly simplified my life! Jack Reacher is certainly a simple man who loved his way of life. The streets aren’t for me, still a cottage with a place to lay my head and light where I can will do. Yes, all of us cannot live the way JR does. Thank god that he is just a fictional character! Let us be in that City. Good one. I was not sure if I will write this weekend specially on the title, but I could relate my disappointment of challenges (water issue) with convenience vs hoarding stuff (living as minimalist as possible). Just scribbled something on this LBC (of course on a Sunday, as against Friday) 🙂 that has become a kind of norm for me. You are just the right age to consider building a city like that! And with a real life Simple alongside, it should really be simple!